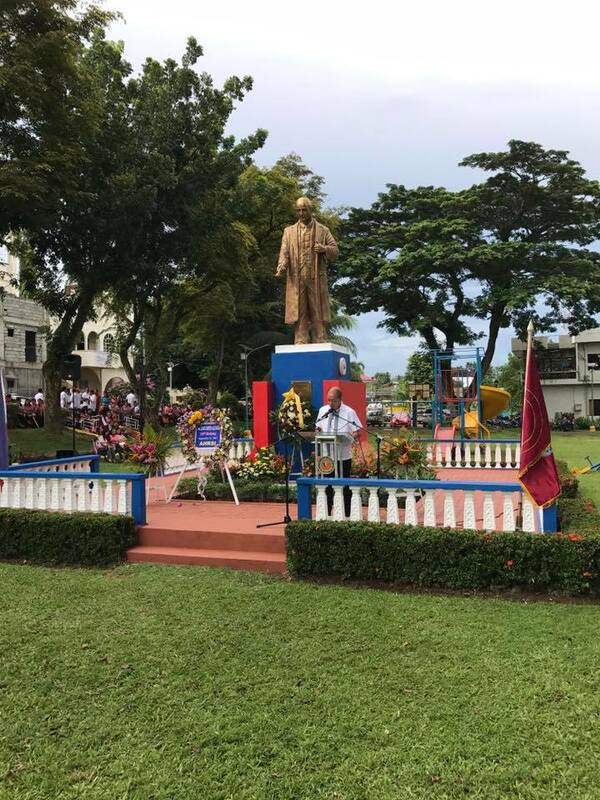 Under clear skies and good weather, the statue of Senator Jose Cortes Altavas was unveiled, blessed and dedicated on September 11, 2017 in the town plaza of Altavas, Aklan. 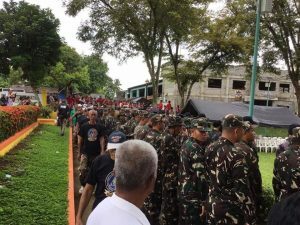 The unveiling ceremony was preceded by a parade with a platoon of army and police, school children and teachers, employees and barangay folk. 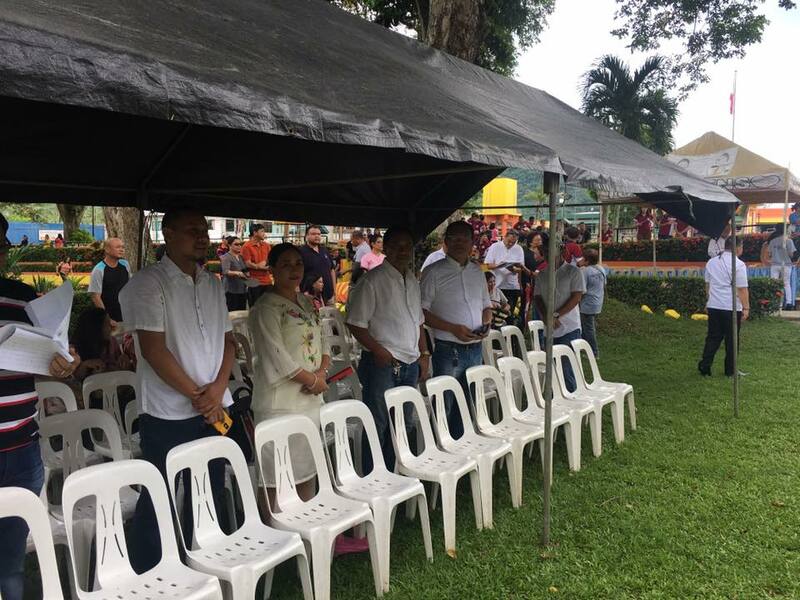 The ceremony was attended by officials of the Municipality of Altavas, members of the Altavas Historical Society (which spearheaded the event), the Altavas family, and the gracious people of Altavas (Altavasnons). 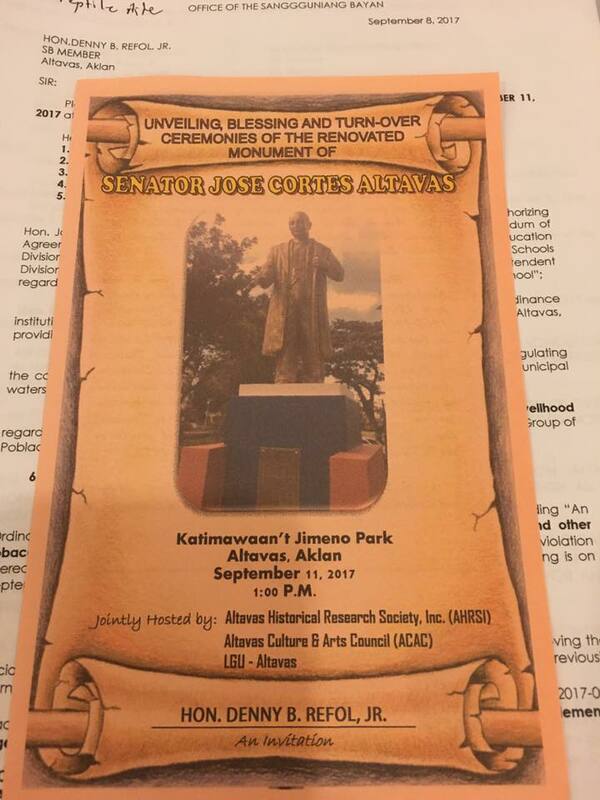 The 140th birth anniversary of Senator Jose Cortes Altavas will be celebrated on September 11, 2017. 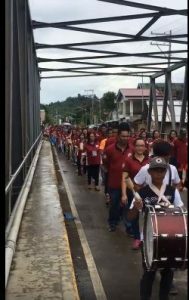 Furthermore the 100th year founding anniversary of the town of Altavas in the province of Aklan is on January 2018. 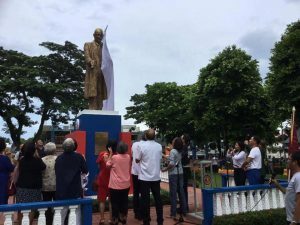 In early May of this year 2017, planning was started to commemorate both anniversaries honoring Jose Cortes Altavas. In a series of meetings in Baybay, Roxas City – Ike Altavas, Hutch Altavas, Dickie Altavas, Pat Cleope (of Altavas, Aklan), John Alaban, and Galen Altavas, and in consultation with the Altavas family and friends, the Altavas Historical Society, and the Altavas town government officials met to plan activities for these anniversaries. 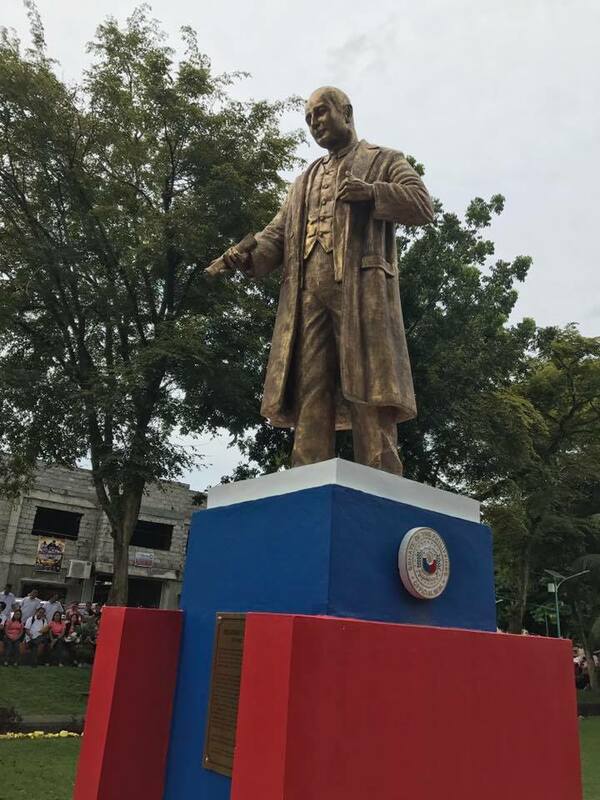 One of the major initiatives was the creation of a statue of Jose Altavas to replace the bust of Jose Altavas in the town plaza of Altavas, Aklan. 2016 started with hope and promise. 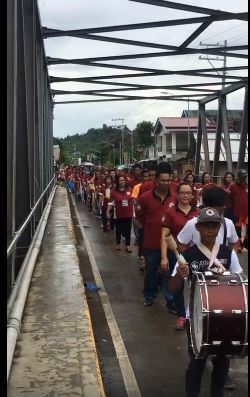 Time, perhaps, to help change history both in the Philippines and the United States with our votes. Depending on who you voted for, there was elation or disappointment. But the verdict is not yet out. The coming year, or years, will tell and history will judge. In this “master” blog, I’ve included three blogs which are retrospective views (although political in nature) of 2016. 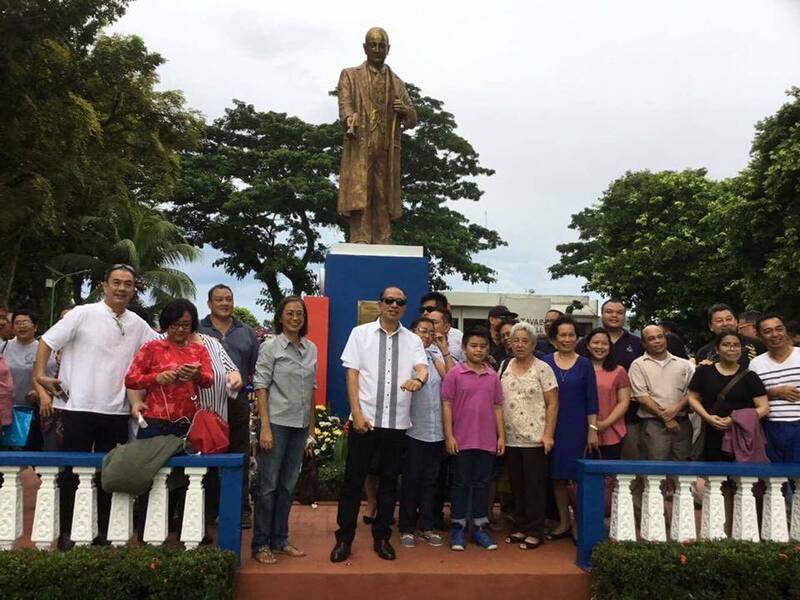 I was in Roxas City with my wife and two kids (actually, adults) in 2011 during the Christmas holidays. 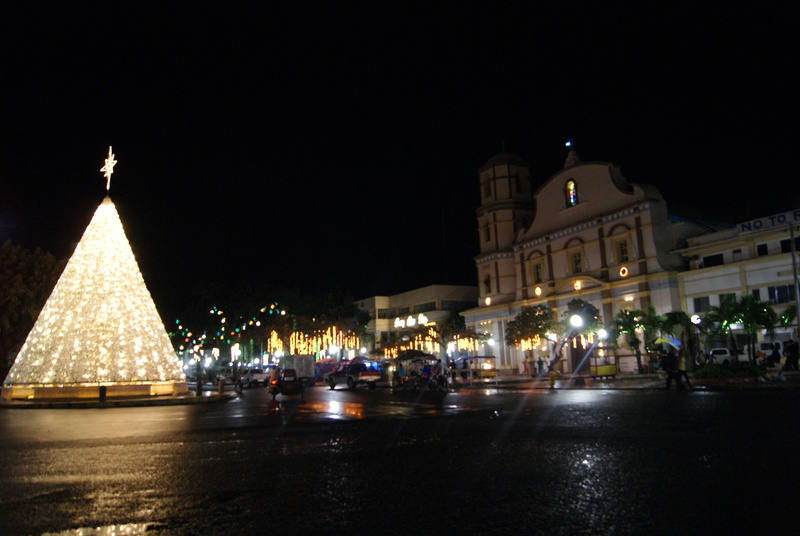 Cool night air, wonderful and delicious food (remember, Roxas City is the seafood capital of the Philippines), especially the hot peanuts by the cathedral, family, Christmas carols, and Baybay Beach. This was the last year I spent Christmas with my mom. We, including my sister’s family, went to Mt. Carmel Parish for midnight mass. On the way home from church to Baybay, we passed by the plaza, the provincial capitol, and the cathedral and were greeted by a wondrous sight of Christmas lights. 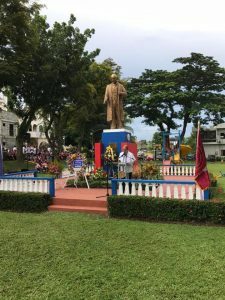 Ferdinand Marcos was secretly buried at the Libingan ng Mga Bayani on November 18, 2016. A thief in life, a thief in death, a thief after death. 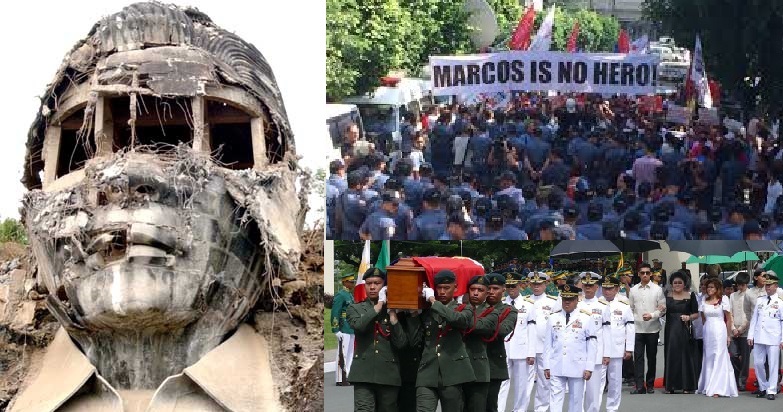 Whether he was buried in Ilocos Norte, at La Loma cemetery, or in my backyard, Ferdinand Marcos will never be a hero. 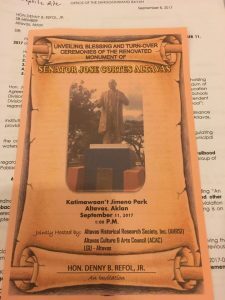 His interment at the Libingan will not erase all the lies, deceit, malevolence in his lifetime. 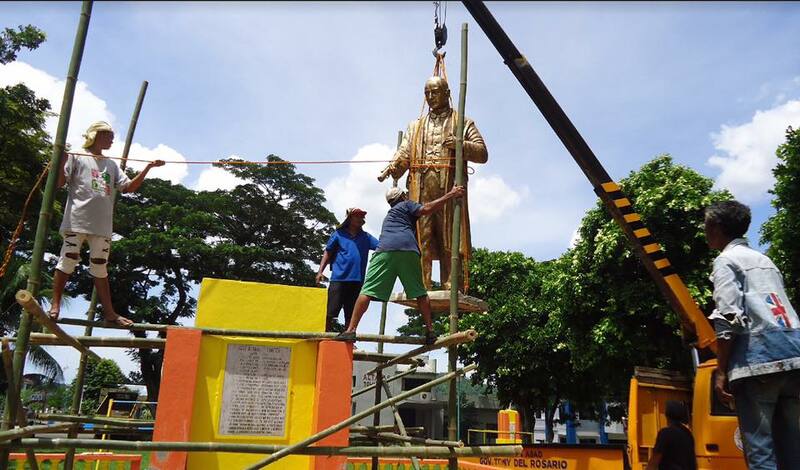 His epithet will always be “Dictator, Murderer, Liar, Thief”. 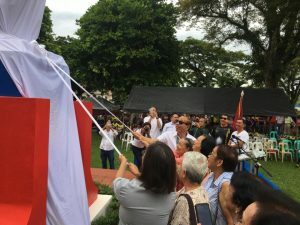 His interment at the Libingan will not change his dark legacy but it will sully the honor, valor, and sacrifice of all our heroes in the Libingan. A rotten apple in a blooming orchard of wondrous fruit. 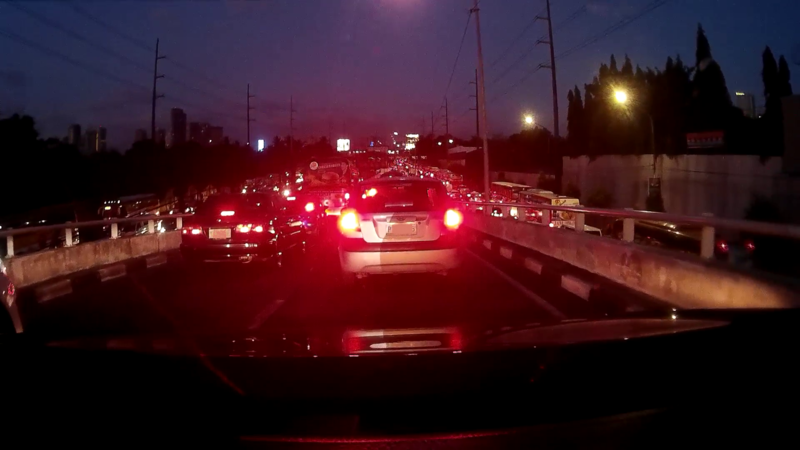 Metro Manila Traffic — It’s a Mess! On Feb 26, 2016, about 11am, we decided to drive from Quezon City to Makati to meet some friends. The trip from Congressional Subd. 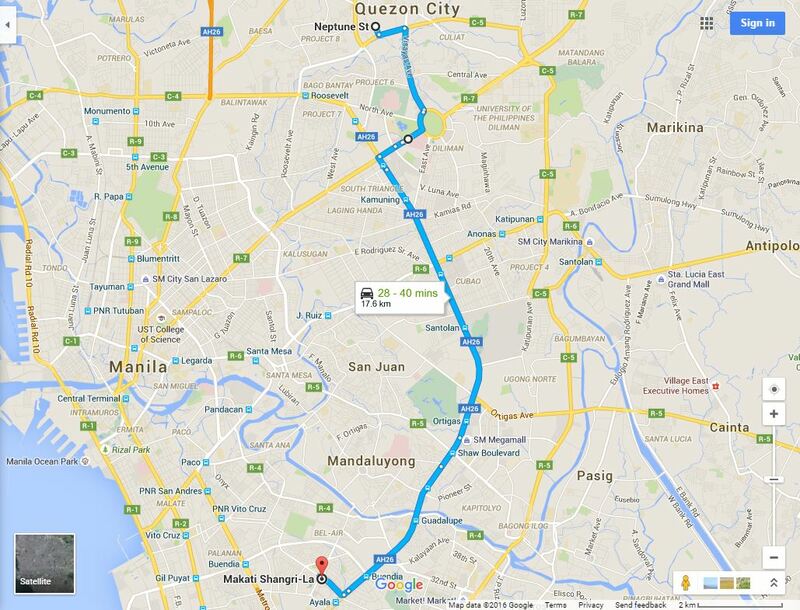 in Quezon City to the Shangri-La Hotel in Makati is 17.6 kilometers. The trip should have taken only between 28 – 40 minutes. It took us about one hour and sixteen minutes (1:16) to make the trip from Quezon City to Makati. 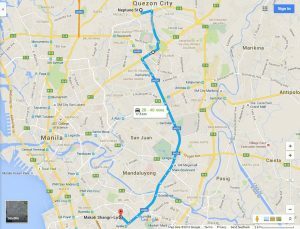 We drove from Congressional Ave. (between Mindanao Ave. and Visayas Ave.), through Visayas Ave., Quezon Memorial Circle, Quezon Ave., EDSA, and Ayala Ave., to the Makati Shangri-La Hotel. The 17.6 kilometer (10.9 miles) trip took slightly more than an hour — not bad, you say — but our average speed was about 14 kph or 8.6 mph. The people have spoken through their votes. 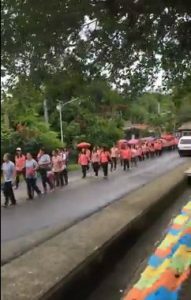 Rodrigo Duterte is the next president of the Philippines and Leni Robredo is leading the count to be the elected vice-president. Let’s move on and let the elective process continue, take its course, and end. 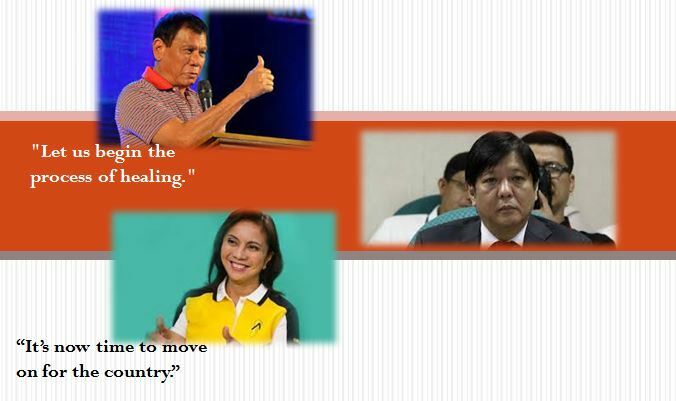 Mar, Grace and Jojo have conceded to Rody. 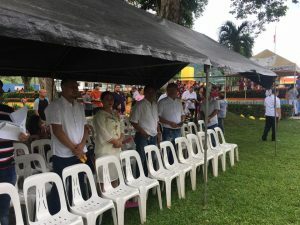 All the other VP candidates, except Bongbong, have all but accepted that Leni won. 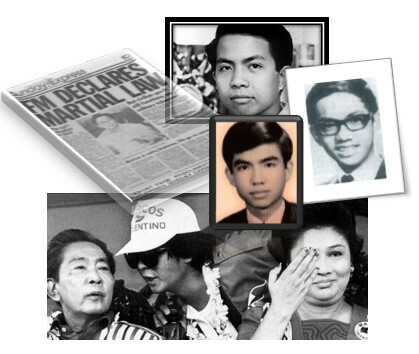 There are forgotten heroes who died during the tyrannical Martial Law regime of Ferdinand Marcos. Among them are Edgar Jopson (Edjop), Abraham Sarmiento, Jr. (Ditto), and Artemio Celestial, Jr. (Jun). 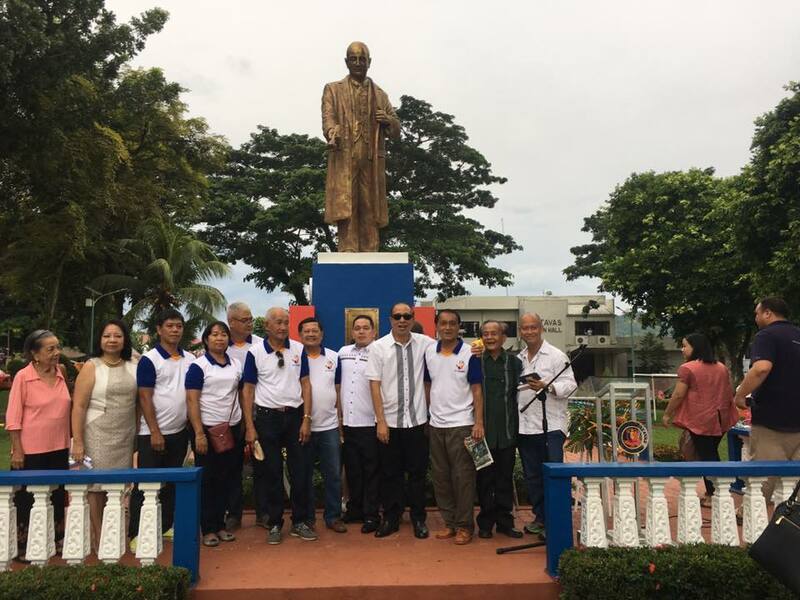 I had the honor of being in school with them – Ditto was my classmate in high school, Edjop was ahead by one year in high school and college, and I was ahead of Jun by a year. 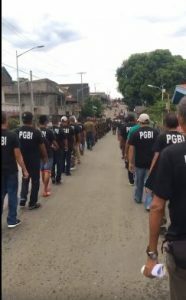 For those of us who came into adulthood during Martial Law, it was a tumultuous, traumatic, and uncertain time. We lost a lot during martial law. We lost our political innocence. We lost our sense of security and certainty about the future. We lost our naivety. We lost 25 years of economic growth. We lost friends. 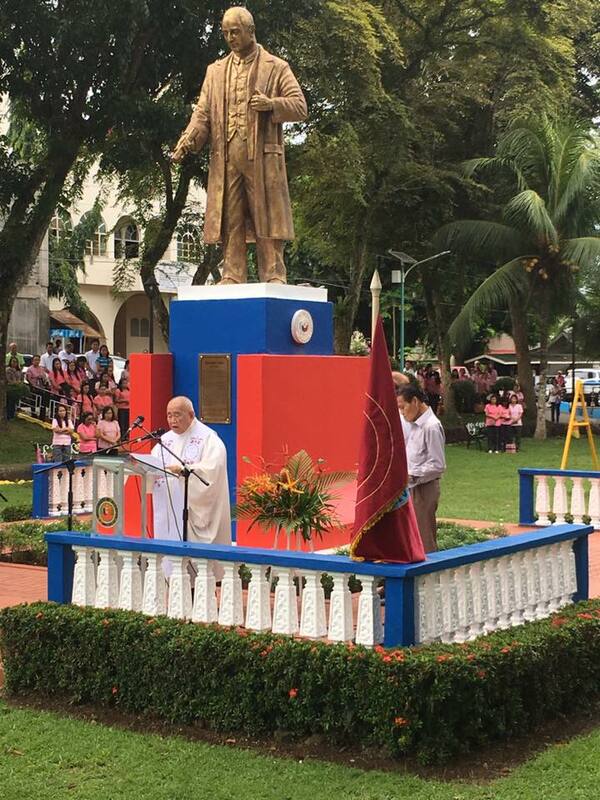 What can I tell the future generation of Filipinos? 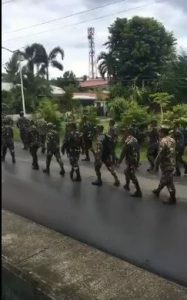 That we were almost there? That we were on the cusp of greatness and prosperity and that we blew it? That we did not elect the right president in 2016? 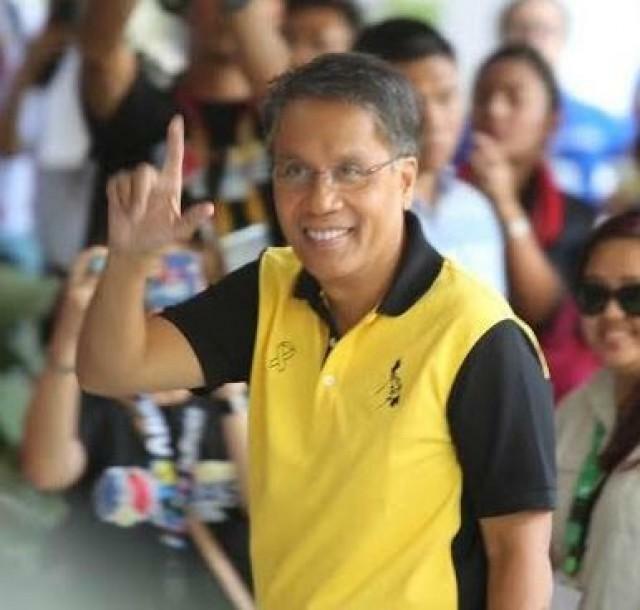 During the past five years of the PNoy Aquino administration, the Philippine economy has grown steadily at an average rate of 6.2 percent a year, which has been the highest in the past 40 years. 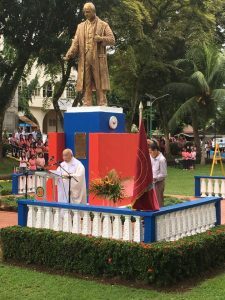 After having lagged behind other Asian economies and dubbed the “Sick Man of Asia”, the Philippines is now one of the more dynamic economies in the world and the country is seen as having the potential of sustained economic growth in the coming years.